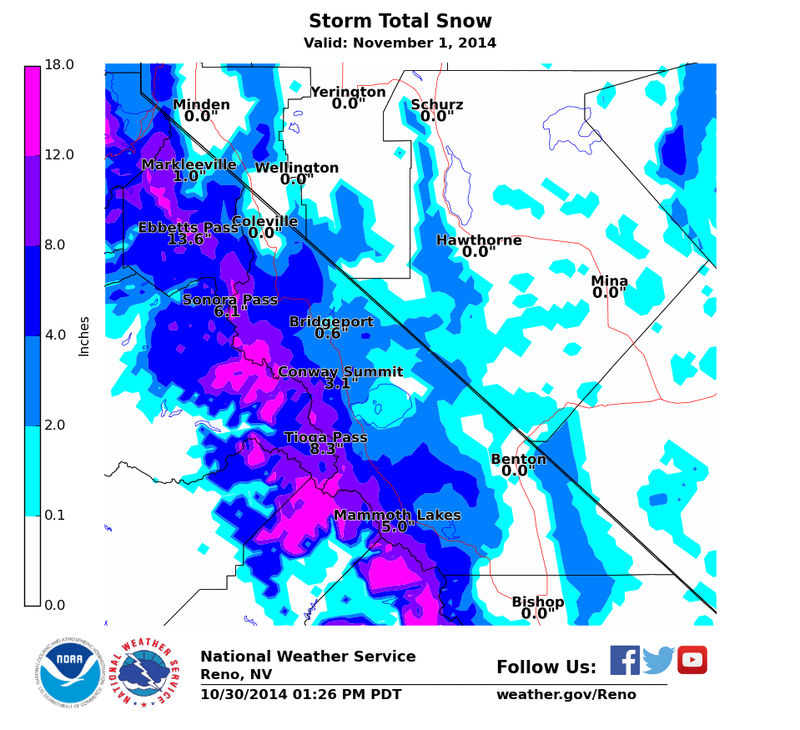 The storm continues progressing towards the Sierra and will arrive tomorrow evening. The storm arrives a little later than initially thought, but the heaviest snow and precipitation will still fall Friday evening through Saturday morning. It will continue into Saturday afternoon before tapering off Saturday night. Snow levels will begin around 8000 ft. and will drop down to below 5000 ft. Saturday morning. The heaviest precipitation will fall with the snow levels between 5500 ft. and 7500 ft. Snow accumulation for the next 72-hours. 95% probability of receiving up to but not exceeding the contoured values. So Truckee has a 95% chance of receiving up to 4-6" of snow. Image via WPC. The strong upper level low pressure system (trough) shifts its overall tilt as it impacts the Sierra tomorrow. The trough becomes more negatively tilted (think of this symbol: \ ), the flow wraps back around on the lee side (east side in this case) inducing more upslope flow for the east side of the Sierra increasing snow and rainfall totals. Storm total precipitation forecast. 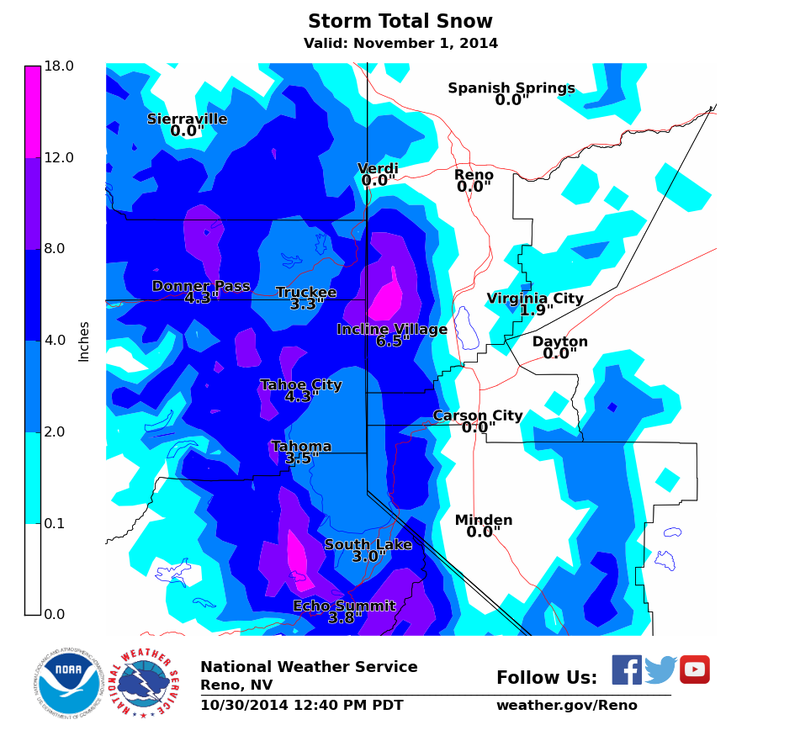 Via NWS WFO Reno. Additionally, the cold air in the trough will help produce convection, which will pump moisture up and over the Sierra. A broad area of upper level divergence (supports upward motion) will aid this process and stay intact as it moves over the Sierrra, which does not always happen. And finally, the lack of downslope winds due to the trough's trajectory and vertical temperature and wind profile will not disrupt upward motion on the east side of the Sierra. Snow accumulation will be the toughest to gauge with the warmer ground. We could see snowfall totals diminished due to the first brave snowflakes melting. However, as they melt and evaporate, the ground cools and with the near to below freezing temperatures forecast, will set the stage for snowfall accumulation eventually. Storm total snowfall forecast. If snow levels drop quickly, snow totals could increase by 10-25%. 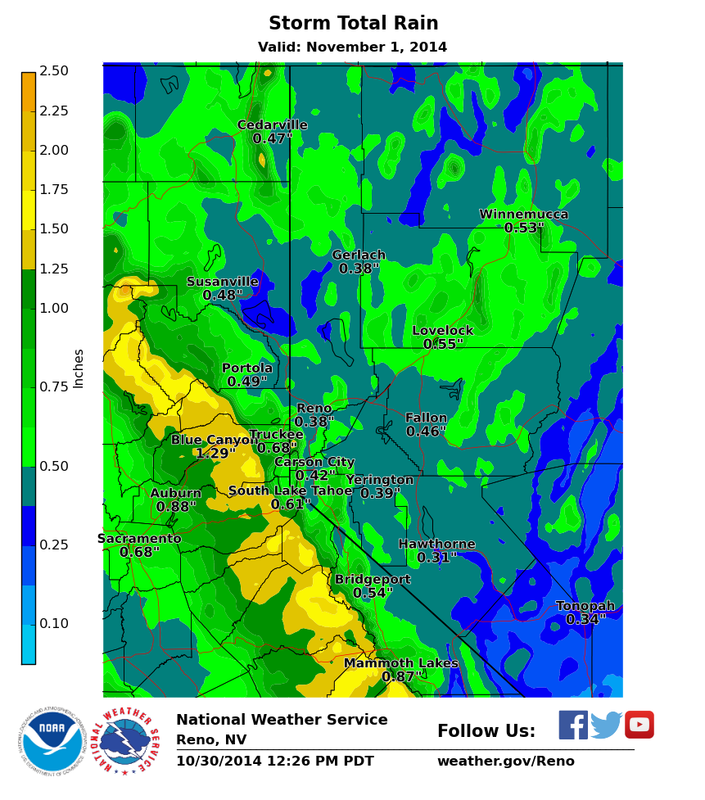 Via NWS WFO Reno. In summary, this system isn't the coldest, it isn't the wettest, but it has plenty of both to give us a nice early season snowfall. It's trajectory and intrinsic vertical temperature and wind profiles will also help give the east side more snow and rain than it would normally receive. Enjoy a rainy/snowy Halloween and be safe on the roads this weekend! Well we weren't going to start posting until later in November, but as usual Mother Nature has her own schedule. We have a nice Fall storm heading our way that will impact the Sierra Friday and Saturday. So pick the warmer of the two Halloween costumes you are deciding between and enjoy some early season snow. An Aleutian Low has set up and will move south and east displacing our 3-year nemesis aka the ridge in the process. This low pressure system splits multiple times in the next 48-hours as it moves onshore. This splitting produced a shortwave to our north (Pacific Northwest) and one that will slide further south taking the best moisture and lifting along with it. Snow accumulation for the next 72-hours. 95% probability of receiving up to but not exceeding the contoured values. So Truckee has a 95% chance of receiving up to 4" of snow. Image via WPC. A silver lining with the core of the low pressure system further south is that it will be colder, which means snow levels won't be a problem. Snow levels will begin around 8500' Friday afternoon and ultimately drop below 5000' on Saturday. Snow levels will be between 6000' and 8000' during the heaviest precipitation Friday evening and night. The models have been slowly trending to less snow around Tahoe and more snow further south due to the aforementioned reasons. 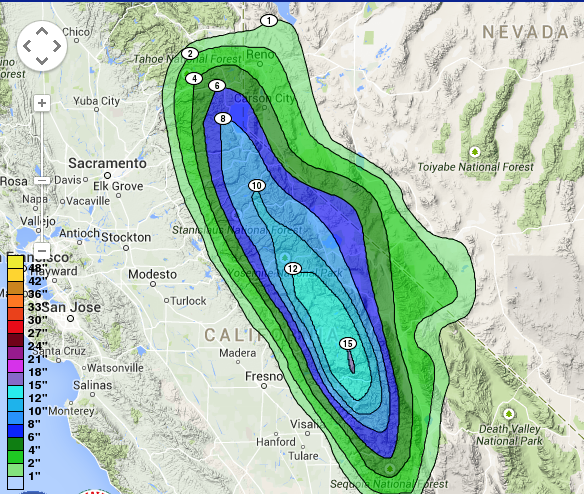 A solid 4-8" will be prevalent around Tahoe especially west of Tahoe near the crest. The southern Sierra will see more than 1' with most areas receiving 8-12" of snow with the highest peaks totaling 12-18". It looks like the ridge builds back again after this storm, so hopefully we don't lose all of the snow we will get this weekend. So go out and enjoy your Halloween, but bundle up because it will be cold and snowy. We all remember the extreme weather of October 2012; Superstorm Sandy and its destructive storm surge along the New Jersey coastline and the heavy snow accumulation further inland along the West Virginia Appalachians. Sandy's trajectory, not unlike many other late season hurricanes, particularly those that transition into full or partial extratropical storms, can be traced back to the deep southwest Caribbean. This location, northeast of Panama and west of Columbia, is often a breading ground for late season tropical development. Storms that originate in this vicinity and move northeast toward Cuba in mid to late October, at a time when the subtropical northeasterly trade winds temporarily relax, often become exposed to the cold air intrusions from the mid-latitudes. For some local context, further west over the heart of the southern Pacific basin corollary processes can develop that dramatically impact the fate (and precipitation amounts) associated with wintertime storms in the Sierra. The interaction between the low and mid latitudes defines an elusive airmass coupling that promotes extreme weather. The current synopsis (and extended forecast) reveal similarities of such tropical-extratropical interaction that eerily resembles October 2012, with a few important exceptions. In October 2012, warm ocean temperatures and moisture convergence in the southwest Caribbean in conjunction with a low-level inflow of momentum produced hurricane Sandy (Figure 1, left). The current forecast reveals similar ingredients and tropical development in a vicinity further west and just south of Guatemala (Figure 1, right). Figure 1. 850 mb Geopotential heights and wind for late October 2012 (left, WRF analysis) and 2014 (right, GFS forecast). Note the cyclonic development just north of Panama (left) and just south of Guatemala (right) and the trail of westerly momentum inflow to the south and west of the cyclonic circulations in both instances. Sandy intensified rapidly to hurricane strength as it moved northeastward before weakening just north of Cuba where it encountered cold air surging south from the mid-latitudes. The fate of the current storm remains unknown. Previous forecasts have hinted at the system redeveloping in the Caribbean and following a similar path as Sandy northeast toward Cuba. Sea surface temperatures in the development vicinity for both events are remarkable similar as shown in Figure 2. The sea surface temperature gradient just north of the equator off the west coast of Ecuador/Columbia is believed to be responsible for the formation of a low-level momentum surge (from the west) that becomes a direct inflow into the developing cyclonic circulations in both instances. Figure 2. Sea surface temperatures for October 19, 2012 (left) and 2014 (right). Note the gradient off the west coast of Ecuador/Columbia just north of the equator. In 2012, Sandy encountered a cold mid-latitude trough just north of Cuba. The cold air and the vertical wind shear that ensued led to the weakening of the hurricane environment. However, Sandy then developed mid-latitudes characteristics as it moved northward along the East coast and became a hybrid storm (a morphed system of both tropical and extratropical attributes). As it neared the mid-Atlantic coast, Sandy encountered a large block in the flow field extending southwestward from Greenland which steered the storm into the New Jersey coastline. The existence of the block has implications to the state of the Arctic at the time and the cold air surges of mass that extended southward and preceded Sandy's arrival in the mid-Atlantic region. The similarities that exist for the current synopsis are interesting and watch worthy, although the Arctic region has not demonstrated strong cold surges southward in recent days that would precipitate a blocking pattern consistent with the 2012 scenario. Tropical-extratropical interaction is not exclusive to hurricane activity. Cold air surges into the subtropics and tropics are known excite ongoing convection near the equator. Outflow from tropical convection and associated vapor is also known to surge northward into the mid-latitudes, often in the form of atmospheric rivers or tropical moisture plumes. The order of interaction continues to be an active area of research and is likely a nonlinear mechanism, meaning a tropical plume surge northward is a function of north and south correspondence and not exclusive to one component. The timing of tropical plume surges, particularly over the Pacific basin, has strong implications on precipitation for the Sierra Nevada, almost exclusively during the winter months (i.e., snowfall). The correlation between tropical plumes and snow in the Sierra is strong if the interaction (and the attributes involved) align appropriately. When is the average first freeze date for Reno? I was thinking about this last week because I am a huge weather nerd, AND I felt like it should be coming up or here by now. I was correct. Table 1 below shows the average last freeze, first freeze dates for Reno, South Lake Tahoe, and Truckee. I know it seems backward to have last freeze earlier in the year, but this is based on the last freeze of the spring compared to the first freeze in fall or late summer. Table 1: Listing the average last freeze and first freeze dates and the average number of days between the two for Reno (Reno-Tahoe Airport), South Lake Tahoe (South Lake Tahoe Airport), and Truckee (Donner State Park). Using ACIS data. This year has obviously been warm and dry, hence the worsening drought. Minimum temperatures in the region have averaged 2-6°F above normal since our last freeze. Table 2 (below) displays Reno's record stretch without a freeze and South Lake Tahoe's and Truckee's near record stretches. Table 2: Listing 2014's last freeze and first freeze dates, the average number of days between the two, and the all time rank in recorded history for Reno (Reno-Tahoe Airport), South Lake Tahoe (South Lake Tahoe Airport), and Truckee (Donner State Park). Using ACIS data. Reno is about a month overdue for its first freeze similar to what South Lake Tahoe and Truckee experienced earlier this year. The last freeze occurred about 2-3 weeks earlier than normal for South Lake Tahoe and Truckee and nearly 7 weeks early for Reno. Reno set a record this year with the earliest last freeze on April 5th, and it is approaching the record for latest first freeze of November 3rd. Our best chance for a freeze is Sunday night in Reno, but if that does not happen we will have to wait another 5-7 days before we get another chance with the current models' solutions. If it does freeze Sunday night in Reno, 205 days without a freeze would beat the previous record of 193 days in 1992 by nearly 2 weeks. When examining hard freezes, temperatures 28°F or below, 2014 currently ranks 13th (204 days) in Reno's history (back to 1937). If we do not get to 28°F or below Sunday night then 2014 would assuredly be in the top 10 for longest stretches without a freeze and approaching the top 5 (218 days). The all-time record without a hard freeze was set in 2004 when Reno had it's earliest last freeze (March 4th) in recorded history. So hopefully your gardens enjoyed this stretch of warm weather and the relatively wet warm season (May through September) we had in Reno (119% of normal precipitation). This reminds me of an old-Midwest wise tale about snowfall. The first time you received more than 3" of snow in November, that date was the number of snowfalls you would have for the rest of the winter. It held up relatively well, and let's hope a delayed start to our fall and winter will see the Sierra turn a corner for colder and wetter weather. Why should you not concern yourself with seasonal (or longer) forecasts of the Earth system? Quite simply, it all comes down to the fact that we are operating in a complex, nonlinear system that is highly dependent on the initial conditions. We know a few, but since we don’t know what each molecule of air or water vapor is doing we are just guessing. Edward Lorenz clearly demonstrated this in the late 1960s, shortly after John von Neumann and Jules Charney produced the first numerical weather forecasts. While state of the art models have made impressive progress in forecast lead times over the past 50 years, at longer forecast times the problems of numerical error growth (floating point and truncation) results in diverging solutions as does the failure to accurately represent the physical mechanisms at various, interacting scales. As the equations of fluid motion have no analytical solution, numerical approximations must suffice and thus are susceptible to the aforementioned numerical errors. Turbulence in the atmosphere and ocean are critical components involved in the transfer of energy both up and down scales, and are not closed mathematical systems. Unclosed mathematical systems have more unknowns in the set of equations than known equations. This problem has been haunting physicists since initial recognition of the problem in 1924 by Keller and Friedman. Approximations are the only way around this, and out the window goes long-term skill. The list of issues goes on, from poor resolution of terrain that exerts a tremendous influence on the regional and global circulations (see Broccoli and Manabe 1992) to the formation of clouds in all environments. 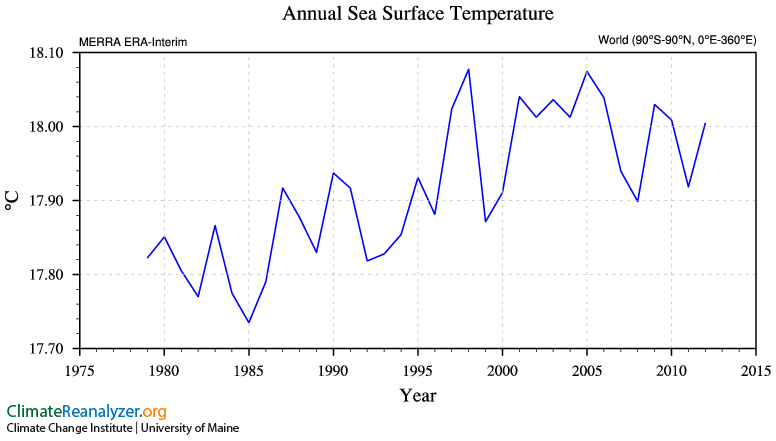 Figure 1: Global averaged annual sea surface temperature from the MERRA ERA-Interim reanalysis model and observational data assimilation product. Global climate models do a phenomenal job of recreating physically reasonable features predictability with skill continues to disappoint. This is likely due to the issues listed above (turbulence, not knowning the states of all molecules) as well as significant biases in key fields, such as sea surface temperatures (SSTs; see Figures 1 and 2). Thus I see virtually no use, unless your interest is in wasting time, to make a seasonal, let alone multiple-season (i.e., extended winter NDJFMA) forecast, as an educated guess versus a random guess will likely demonstrate the same skill. 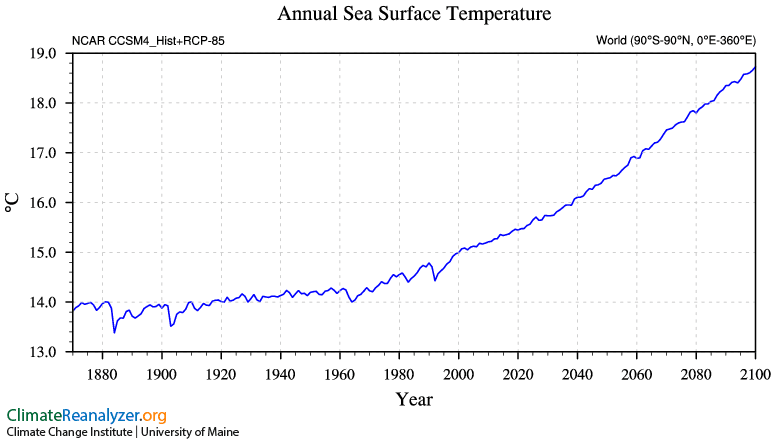 Figure 2: Global averaged annual sea surface temperature hindcast (1870-2013) and forecast (2013-2100) output from the CCSM4 global climate model. Note the ~3°C cold bias of CCSM4 and the linear increase in SSTs. Few natural systems are so linear, and this is cause for concern both in the modeling approach and the potential system responses (abrupt climate change anyone?). Relationships between predictor variables are demonstrably nonstationary (Ramage 1983). This means that the relationships change over time. For example, for some period of time the negative phase of ENSO leads to less than average precipitation but then for some other period the opposite is true. Big trouble! The use of stationary assumptions developed over a finite period of time will only confound the prediction process. Relationships do exist, of course, but the interactive nature of the forcing terms greatly complicates the matter as these relationships change as boundary conditions change and are subject to variance in higher frequency forcing terms which also perturbs the 'known' relationships. Even if we did know all of the conditions, we still can’t solve the equations analytically! It should be easy to see why forecasting at lead times longer than 7-10 days will only lose you money. That said, GCMs are excellent tools for examining sensitivities to the climate system, such as how the hydrologic cycle will respond to a warmer planet (warning, not good! See Held and Soden 2006 and Trenberth 2011 for depressing news). The bottom line is just wait and see! Spend your time training, visualizing, and planning for radness. This way, your season will be awesome no matter what the outcome. What does El Nino mean for us? 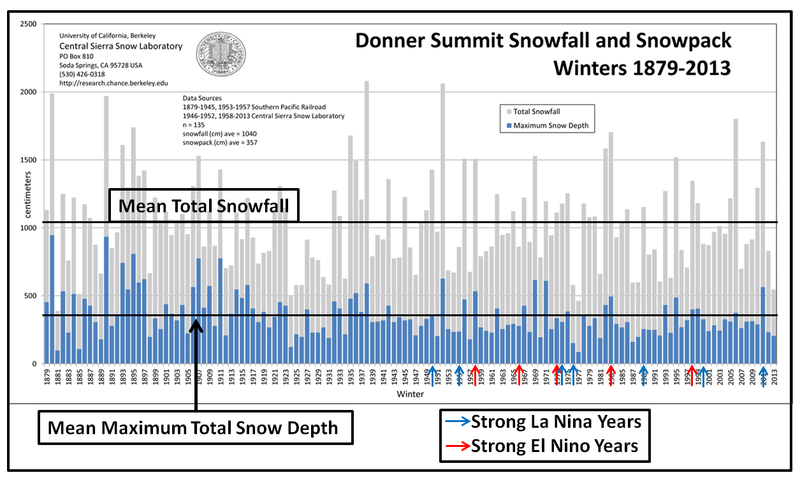 Figure 1 only includes strong ENSO data back to 1950 and it should also be noted that measurements prior to 1946 might be less accurate and thus the mean total snowfall and maximum snow depths may not be completely accurate. So what does it mean for this winter??? Well in reality, it just means that we have no way of really knowing what is going to happen this winter in the Central Sierra. 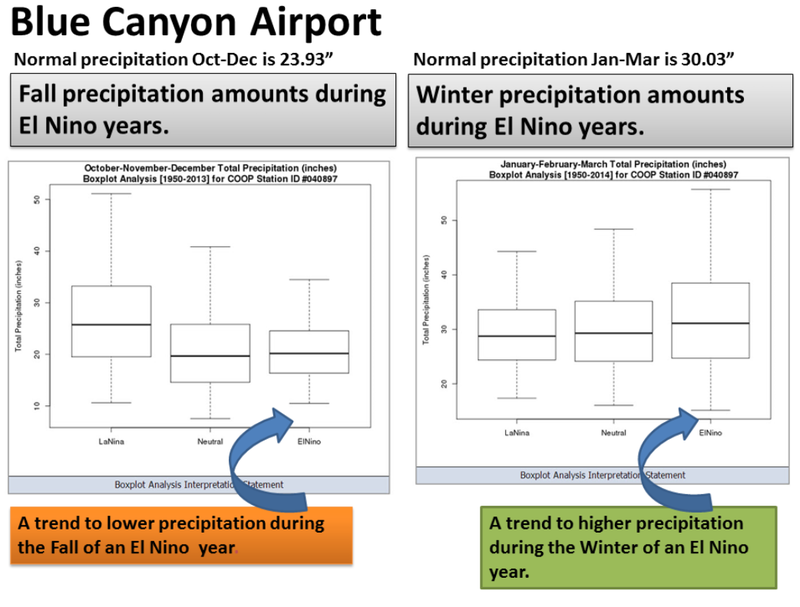 In case this isn’t enough proof check out the October-March precipitation in Reno, NV (Figure 2, compliments of WRCC) and Blue Canyon, CA (Figure 3, compliments of NWS Sacramento) based on ENSO. 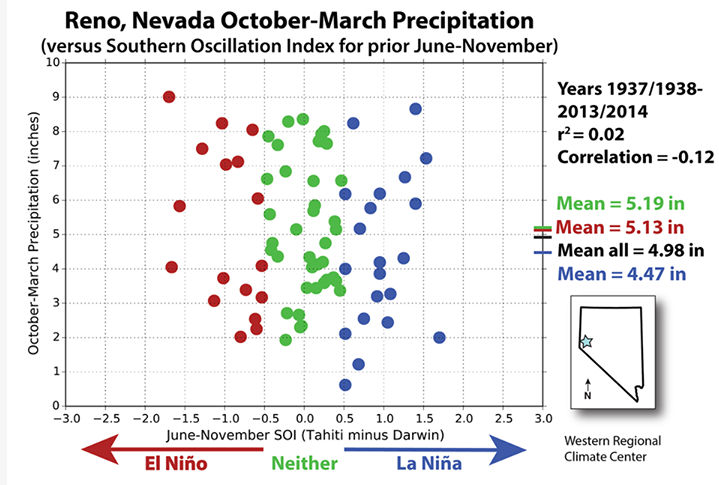 There is absolutely no relationship between ENSO and precipitation amount in Reno. Meanwhile in Blue Canyon when the October-March is broken into fall and winter, there is more precipitation in winter during El Nino and more precipitation in fall during La Nina. Bottom Line: The lack of signal between ENSO and precipitation makes it extremely difficult to predict this or any winter's snowfall in the Sierra/Tahoe region. How are NOAA’s seasonal climate outlooks developed? The Climate Prediction Center (CPC), a branch of NOAA, issues the operational seasonal climate and drought outlooks for the US. 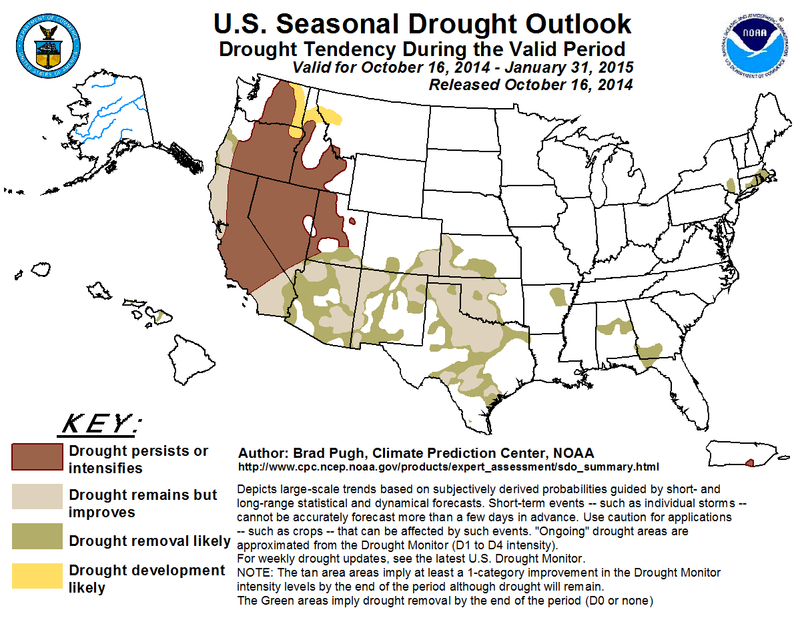 Figure 1 shows the official US seasonal drought outlook that is valid through the end of January, 2015. This map shows the likelihood of drought development, removal, or persistence. Pretty sad looking for much of CA and NV. However, these forecasts must be taken with a grain of salt, as skill beyond ~two weeks remains quite low. Remember, these are climate outlooks, and not weather forecasts. The CPC is not predicting individual storm events, but rather departures from mean climate states. So, how are these maps developed? Well, there is one dynamical model (Climate Forecast System Version 2 (CFSv2); based on atmospheric physics and weather dynamics), and a variety of statistical methods that use historical conditions and patterns to predict the future (If you are interested in the technical details, follow this link: http://www.cpc.ncep.noaa.gov/products/predictions/90day/tools.html). Statistical models can be just as reliable as dynamical models at long lead times because the atmosphere is a nonlinear, chaotic system that is not perfectly predictable by any means. A limited set of variables are used for seasonal prediction, and typically include temperature, precipitation, soil moisture, and sea surface temperature. Multiple dynamical models (as opposed to just CFSv2) can also be used to reduce the uncertainty of a single model. The average forecast is taken from several different models, and is termed an ensemble forecast. Studies have found the ensemble approach to typically be more accurate than one model, but skill at seasonal lead times remains low. 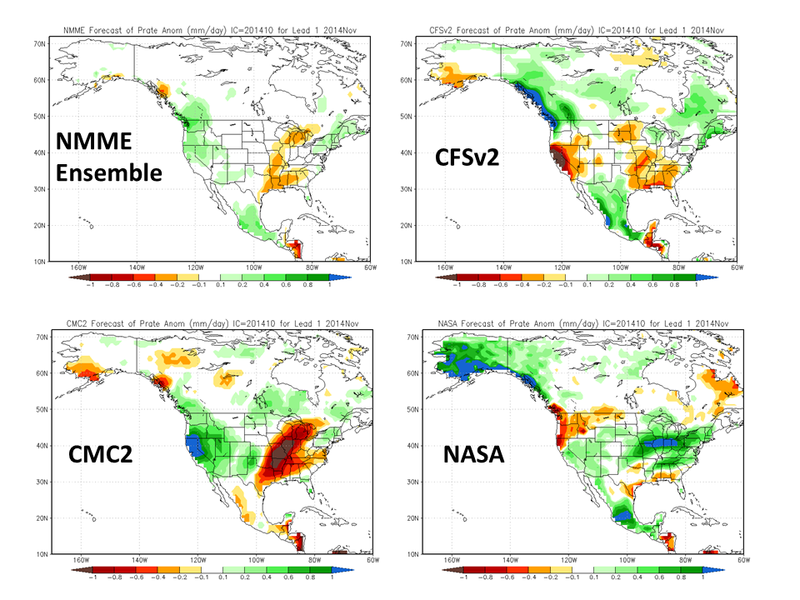 The North American Multi-Model Ensemble (NMME) is an experimental project that provides individual forecasts and an ensemble forecast for eight different models, including CFSv2. Figure 2 shows the November average precipitation anomaly (mm/d) from the NMME ensemble and three members of the ensemble. Red indicates abnormally dry and green indicates abnormally wet. If you just look at the ensemble, NMME shows slightly above normal precipitation for CA. But look at how contrasting the three individual members are! CFSv2 is extremely dry, CMC2 is extremely wet, and the NASA model splits the state of CA about 50/50, take your pick! The ensemble basically smooth’s out the contrast found amongst the eight members. members. For all ensemble members and more forecast see: http://www.cpc.ncep.noaa.gov/products/NMME/monanom.shtml. Come back to this post at the end of November and see which model wins! There are an awful lot of resources out there to look at seasonal predictions, but none of them are reliable at this point. One thing that can help seasonal prediction skill is if a model is initialized (start date of the model run) during an ENSO event (El Niño or La Niña). Unfortunately, we are ENSO neutral right now, so the current seasonal predictions may end up being quite poor. Over the next four days, Powdiction will bring you the inaugural Anti-Seasonal Outlook, Seasonal Outlook: A Four Part Series. Each day, a different aspect of seasonal outlooks will be discussed hopefully in a coherent manner. I know you are thinking we may have gone all Peter Jackson with splitting this up and dragging it out. However, we hope this will inform our readers about the current state of the climate (spoiler: not good), what could change it, how it’s forecasted, and the difficulties in doing so. The Sierra Nevada mountain range is in extreme to exceptional drought, which are the two highest categories. 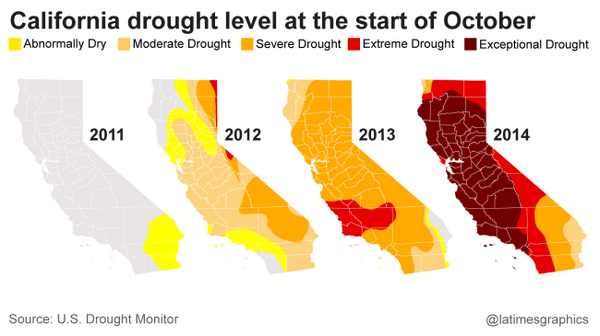 Essentially all of California and Nevada are drought stricken with it being the worst in recorded history in some areas of California. This drought started way back in 2011, after we had an epic powder year. Then the drought progressively worsened each year. Some areas in the Sierra had above average precipitation over the summer, but it barely made a dent into the drought. That is due to the low monthly precipitation averages during the summer (June-August), which makes it easier to be above normal. 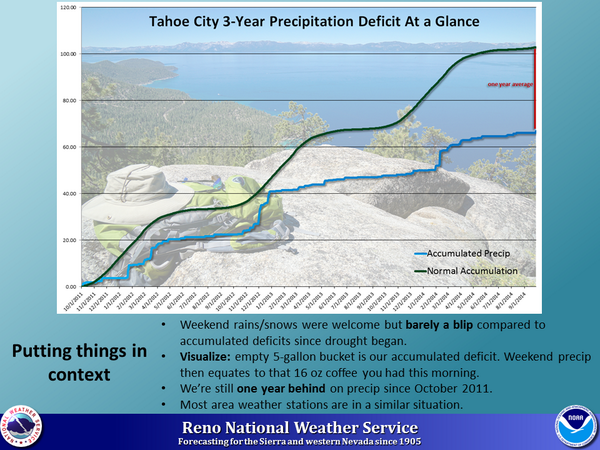 For example, Tahoe City averages 0.30” of precipitation in August, and this August Tahoe City received 0.89” of precipitation, which is nearly three times the average. Furthermore, Tahoe City averages 5.55” of precipitation in December. So 300% of average precipitation in August is only about 16% of normal December precipitation. Most precipitation in December falls as snow, which acts as a water reservoir through the spring and into the summer. Compared to summer thunderstorms, which are usually short, intense rainfall events, snowmelt is preferable due to the increased duration and the gradual nature of the water moving into the soil, plants, lakes, rivers etc. One caveat this year is the rain event we had associated with a tropical disturbance moving along the Sierra August 4th and 5th that brought mostly steady rain. Bottom line, we need a good winter to bust this drought as the below graphic eloquently illustrates. The Sierra depends heavily on cold season precipitation. The majority of the precipitation falls November through March. For example, Tahoe City and Truckee receive more than 70% of their annual precipitation in these five months. So what’s on tap for this winter? For the past 29 months, the El Niño-Southern Oscillation (ENSO) has been neutral. This represents the 3rd longest ENSO neutral period since 1950. And examining ENSO’s history, each instance where ENSO has been neutral for more than 13 months, an El Niño has followed. Well there has been a forecast of El Niño for the past several months. While the Southern Oscillation Index (SOI) has been borderline El Niño since July, the sea surface temperature (SST) anomaly has been stuck in neutral. The SST anomaly is much closer to an El Niño than La Niña currently and has been since the spring. The reason I am discussing ENSO is it can be a strong influence on the weather and climate, and for us to bust the drought; we need a change in the atmosphere. Ridges control the weather and they tend to establish over areas of drought. That does not bode well for us. So a change in ENSO or other atmospheric-oceanic circulations needs to occur to break this rut. In the subsequent posts, we will discuss ENSO, some of the other atmospheric-oceanic circulations, seasonal forecast guidance, the complexity of seasonal forecasting, and how it all affects the Sierra and Tahoe. Stay tuned for Part 2 of Powdiction’s inaugural Anti-Seasonal Outlook, Seasonal Outlook: A Four Part Series!